Imagine a private retreat sitting high overlooking 3 acres of pristine land with fabulous views of the Intracoastal Waterway, marsh and protected natural areas. 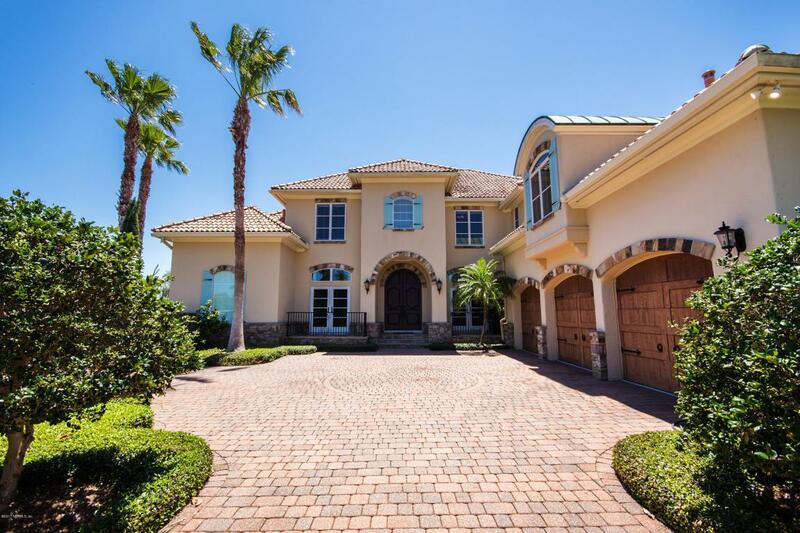 From the gated entrance, down the long winding driveway, you'll find an extraordinary home secluded from the rest of the world, but still in the middle of prestigious Ponte Vedra Beach. This custom residence, built by Elwood Collier, offers an unbelievably private lifestyle and unparalleled quality construction. The attention to detail is spectacular -- every design choice reflects exquisite taste. The block concrete walls, hand-finished masonry stucco, field stone accents and imported Italian clay roof tiles suggest an old-world European era as well as offering protection against the elements. The solid mahogany arched double doormake a grand statement as you enter the formal areas. A gracious living room with coffered ceilings is a lovely spot to entertain with beautiful views of the marsh and natural areas through the arched french doors. The spacious formal dining room easily seats 12 and is illuminated by an antique pewter chandelier. A large wine cellar is perfect for the wine connoisseur, adorned with a solid wood arched door, tumbled tile, and a corkage station. The gourmet kitchen has all the high quality appliances you'd expect including a 4 burner Wolf gas cook-top with a French burner, hand cast hood, double ovens, two sinks and Sub-Zero refrigerators. Gorgeous Corsi pine cabinets provide plenty of storage space for the avid cook. The open floor plan encourages easy flow to the adjoining casual dining area and family room with soaring ceilings finished with beautiful pekey cypress boards and high wood beams. All surrounded by large windows and beautiful natural views. An elegant master suite is appointed with gorgeous hand carved solid wood doors from Provence, an intricate chandelier from Paris and gorgeous hickory hardwood floors. The stately paneled study provides a place for quiet retreat with custom book shelves and elaborate ceiling details. The master suite opens to a lanai with Phantom Screens and breathtaking views. This lanai is also accessible from the living room and family room. You'll love the sunset arbor, graced with a jasmine trellis. A graceful staircase with hand-forged iron railings and elaborate travertine and wood stairs carries you to the spacious upstairs. Or, if you prefer, the elevator opens to the second floor. A light filled studio with built in storage and gallery lighting is a lovely room for art activities, exercise or an additional bedroom. Three additional spacious en-suite bedrooms, including a second master with a walk-in shower and huge closet. A second family room with a wet-bar opens to a screened balcony and again, those expansive views. 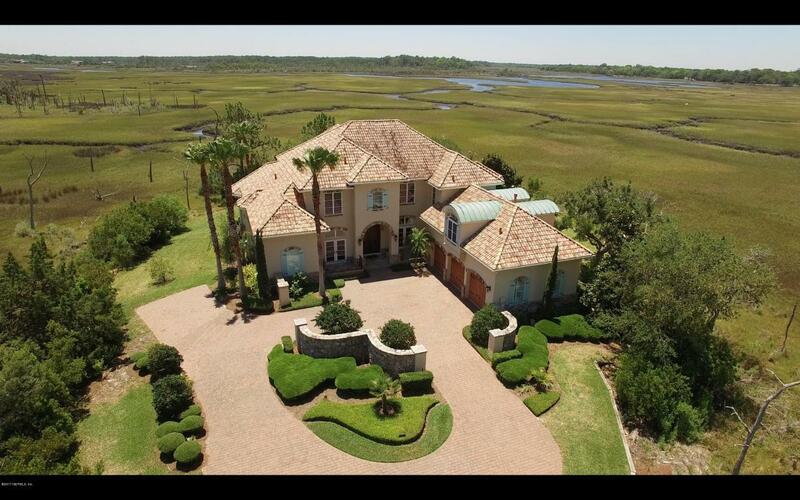 Located at the end of Marsh Landing's North Island, this lovely estate home has plenty of room for a swimming pool and could also accommodate a dock and boat lift, giving you access to the Intracoastal Waterway.